Easy to make, this raspberry sauce adds that extra something to desserts such as Raspberry Mousse Cheesecake and Pavlova. It can also become the star attraction when served with ice cream and peaches for Peach Melba. Fresh or individually frozen raspberries are fine in this recipe. 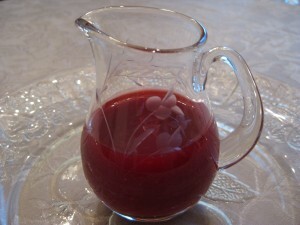 If using raspberries which have been frozen in juice, that juice can be used in place of some of the water. Framboise is optional but adds an elegant note.